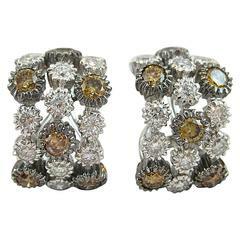 Earrings set with 17 oval parts paved with Round Diamonds weighing 1.81 carats. The Diamonds are GVS qualities. The Clip-on Earrings is 18K White Gold. The Round Diamonds Earrings are set with 0.92 Carat The Diamonds are GVS quality. The Stud Earrings is 18K White Gold and weight 3.93 Grams.